We were delighted when our client contact at the National Oceanography Centre, pointed us in the direction of a blog that CMT cadet Adrian Reid posted about his time on board the science research vessel the RSS James Cook. Adrian is a Phase Four cadet at the Shetland School of Nautical Studies, which means he is in his second sea phase gaining invaluable experience on board a fully functioning ship, before graduating after phase Five and three years of practical and sea-based training. We found it a fascinating insight into how much responsibility a cadet is given, even at this early stage in his career. You can read the original blog below, and if after finishing you think that this might be the career for you, you can Apply now using the tab above…Enjoy! “My name is Adrian and I am a Deck Officer Cadet on board the ship. I am training to be an Officer of the Watch and spend a lot of my time on the ship’s bridge. The bridge is where all the key aspects of navigation take place such as manoeuvring and keeping a look-out for other vessels and navigational hazards. We also monitor all the deck and science operations. “During science cruises one of the most important things we are required to do is to manoeuvre the ship in a way that ensures the best results. Some operations, such as those that use the Megacore or CTD, require the ship to be stationary above the ground. Others, such as using the HYBIS to observe the sea-bed, may need us to maintain a constant speed and course along a track with many waypoints. We also require accurate manoeuvring to provide the best results during picking up of science equipment in the sea as well as triangulation. These things can be very difficult to do manually as you have to constantly provide thrust to account for wind and current. 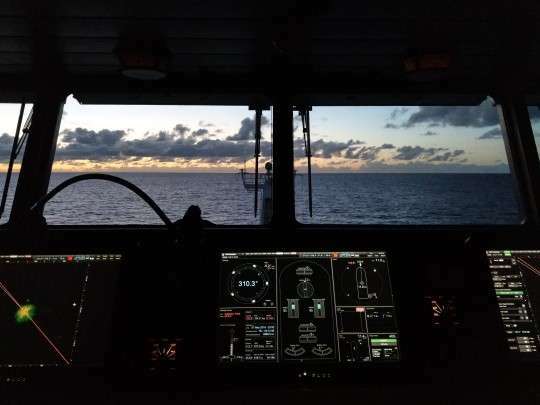 “To help us achieve accurate positioning and manoeuvring we use a Dynamic Positioning (DP) system on board. This is a complex system, which uses an array of sensors to determine the vessel’s current position, vector and how much it’s being offset by other forces such as wind and current. It uses the data gathered to build a model of the various forces acting on the ship and determines what amount of thrust is required to maintain the position or manoeuvre. This allows us to position the ship exactly where it is needed with an accuracy of less than half a metre. “To provide the thrust required the ship has several methods to provide propulsion. There are two main shaft propellers, two rudders, three tunnel thrusters and a retractable azimuth propeller. The main propellers provide forwards and astern propulsion whilst working with the rudder to control the heading of the ship. The tunnel thrusters provide athwartships propulsion and can be used to help turn the ship and maintain a heading, or to ‘crab’ which is to move the vessel sideways, furthermore they can be used to do both of these things at the same time. The retractable azimuth thruster is a propeller which can be turned on the vertical axis to point in any direction with an arc of 360° and can be retracted back into the hull of the ship when not in use. This allows for greater amounts of thrust to be provided where it is needed.